On Thursday and Friday Davie and I worked on the back part of the barn. You can see it needed a lot of work, as some boards have blown off in the last year. The barn looked terrible, and the lack of boards was letting rain inside, on the hay, and everything else. Davie had a tree cut up just for this project, and we finally had the time to get it done. 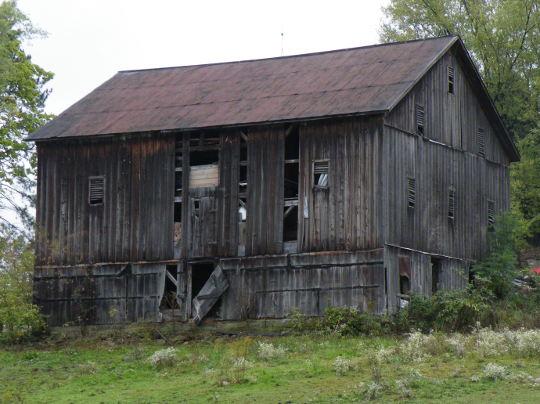 The boards which are missing are 192 1/2 inches long, spanning two floors of the barn. Luckily the rough cut boards we had where about 194 inches long. Before we started, Davie proclaimed me “The Ground Guy”, in other words, I worked mostly on the ground, bringing supplies to the “Ladder Guy”. 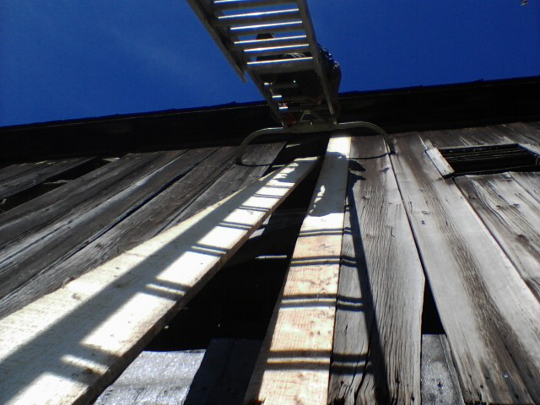 Davie climbed up the 40 Ft ladder, and I handed each board up to him. The process was very different for me, as this was vertical work, different from just about everything else I’ve ever worked on. I was standing on a 10 Ft ladder placed directly below Davie’s, and I found this a bit unnerving. If he accidentally dropped a hammer, I would be the directly in it’s path. Here’s how it looked at the end of the day. 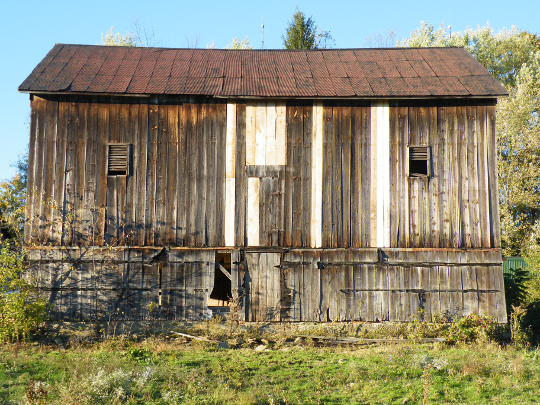 Over about a years time, Mother Nature will stain the boards to match the rest of the barn. On Saturday, I cut some more lumber and fitted it over the whole in the basement. The second story windows still need some work, but that’s a much smaller job for a weekend.